As we left Part 2 (which you can read here) Steve had missed out on the permanent manager's job at Bramall Lane. There followed a spell out of the game. In late December 2004 Thompson was appointed as manager of struggling League Two side Cambridge United, but was made redundant the following summer having failed to prevent Cambridge's relegation to the Conference. He then worked as a summariser for BBC Radio Lincolnshire before being appointed manager of Notts County in June 2006 on a three year deal which was extended by a year in May 2007. A Notts County fan recently said to me that most managers have found it tough at Notts Co, because they are not Neil Warnock! Steve was not alone in finding it a fickle place to manage and was certainly not alone in having a difficult time. With no training ground, no centre of excellence, only a handful of players and a reduced budget, it is hard to see what the attraction of the job was. The trouble with football is that people often live in the past, because that is how comparisons are made. It is very hard to get recognition at Notts County, but that’s the nature of the beast. The one thing about football management is that you are going to get the sack sooner or later. When I arrived there I had 3 players, no training ground, no youth team, a newly elected chairman who had brought Howard in. I had to sign 13/14 players and get them into shape very quickly. I got in there mid-June and we were starting pre-season training first week in July. They had been through such a hard time and the fans were all doom and gloom and then suddenly, as you start winning games, expectation levels rise. The playing budget was next to nothing and obviously we had no youngsters coming through that I could blood to fill the gaps. When I went back Howard Wilkinson was Director of Football and he brought me in. They had just avoided relegation from the League by a point and we finished 11th and reached the Quarter Finals of the League Cup. We lost to Wycombe who went on to meet Chelsea. Unfortunately, Steve was sacked at the start of the 2007–08 season after a disappointing start that saw the Magpies languishing near the bottom of the table. The turnaround achieved the previous season quickly forgotten. Since leaving Notts County, Steve is yet to make a return to football and now works for BBC Lincolnshire as summariser on Lincoln City's games. It was a massive blow for Lincoln when they were relegated again and it is not easy getting back. Plenty of clubs in the Blue Square North are full time and it makes a big difference. Forest Green Rovers are going to be a force in that league this year, with the financial backing that they have. David Holdsworth is the manager and he has a huge task, with no money to spend. It is a tough league and I don’t see why it should just be one team going up automatic and another in the play-offs. For me it should be two automatic and another in the play-offs. When you look back to Doncaster, when they came back into the league they went straight through and Crawley, albeit another club with money, but another team that have progressed. In the lower divisions if you can get two or three player in the spine of the team including a goalscorer you will do well. We finish by talking about his first love and United's prospects for the new season. I would never knock Kevin McCabe; he’s done a fabulous job, the way he stuck up for the club through the Tevez issue and relegation. I heard all the things about Danny Wilson when he went there, he’s a very good manager, an astute guy, he’s knows the division and he knows players. He probably got the job because he’s mates with Kevin McCabe, but he’s proved the doubters wrong getting United so close to promotion and the loss of Ched Evans so close to the end of the season was massive. That play off final defeat was a huge blow, the expectation level has risen, but Danny is not daft. He’s been around the block, he’s got Frank Barlow who is a great right hand man and although they always sell their best players, the one thing United have always been good at is bringing their own players through. At one time United were a club that didn’t have to sell, or at least if they sold it was at a price that was right for the club, but with the Premier League it is just a buyers’ market now. In the past players knew that if they were at United they would be at a strong Championship club, or potentially a Premier League club. Now they have to leave to better themselves and earn more money. The recession makes it hard for clubs and fans. Football has become the rich get richer and the poor get poorer. It is harder for lower league clubs to make money from selling players and if you produce your own player you know you are not going to be able to keep hold of them for any length of time. It’s a great football club, with great supporters and Danny knows that, he knows what a great club it is to manage, and when you are winning there is no better place. I have experienced both ends of the spectrum. I’ve been at clubs when you’re only getting 2,000 and you are losing and I have been at United with 20-30,000 and you’re losing. But when that Kop gets behind you at Bramall Lane it does make a difference. With so many ups and downs in his football career, it would be easy to assume Steve has many regrets, however there is only really one and having spoken to him and understanding his passions for Sheffield and the Blades it is quite understandable. The one thing I was never fortunate to do was play in a Sheffield Derby. 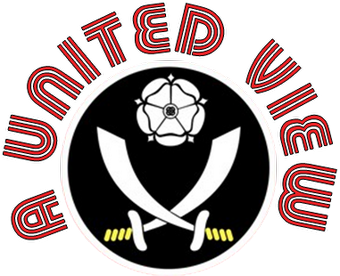 I played in London Derbies for Charlton against Millwall and Palace, but it would have been great to have done it in Sheffield. It is superb as a supporter, but to have played in one……..
Whilst Steve enjoys his radio work, he still hankers after a day to day involvement in football. I have had a few clubs in the last couple of years that have wanted me, but you think you can wait for the clubs that you think are bigger and more appropriate and as time goes on you think maybe I should have done that. I still have aspirations to get back into football as a manager or an assistant. Having sat and listened to him speak passionately about the game for nearly an hour, I only hope that opportunity arises soon.